Once you get a taste of Northwoods Michigan high country golf, you’ll want more. Shanty Creek boasts 72 holes on four unique and distinct championship golf courses, each combining challenging play with Up North natural beauty. When it comes to golf, the bar has been raised. Sporting tight fairways, formidable doglegs, breathtaking hazards, and varying elevations, Shanty Creek’s golf courses put golfers in an enviable position—trying to read and play those challenging greens amid the stunning views. Designed by “The King” Arnold Palmer, The Legend was given 4½ stars in Golf Digest’s “Places to Play Directory.” The Legend’s 600 acres cascade over hilltops with stunning views of Lake Bellaire and into valleys with holes playing alongside and over crystal clear waters. Designed to challenge the most focused golfer, The Legend was named one of the top four resort courses in the United States by the readers of Golf Magazine. Designed by PGA player and architect, Tom Weiskopf, Cedar River Golf Course weaves through the hills and peaceful waters of northern Michigan and has been named one of America’s Top 100 resort courses by Golf Week. One of Golf Magazine’s “Top Ten in the U.S. You Can Play,” this northern Michigan course offers five tees to provide players with challenging yet enjoyable golf. This William Diddel gem is Shanty Creek’s original northern Michigan golf course. It rolls gently across the hills of Antrim County and has been a long-time favorite among golfers who favor wide fairways and fast greens. A favorite among locals who annually name it one of the top public courses in Michigan. 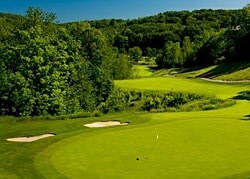 Schuss Mountain GC is a challenging course carved into Pure Michigan. But don’t let the tranquility of this Warner Bowen golf course fool you! Schuss Mountain delivers the challenge golfers seek throughout 6,922 yards of abundant wetlands, rolling hills, and wildlife. 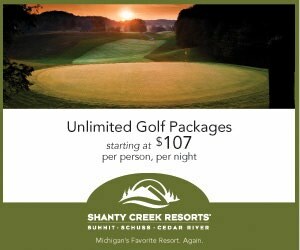 Let Shanty Creek Resorts Golf Academy improve your handicap. Regardless of your ability, our golf instructors teach proper technique for full swings, short swings, and recovery. Improve your driving distance, accuracy, approach shots, hazard saves and putting. For beginners, our instruction includes an explanation of the rules of golf and polite golf etiquette. The Shanty Creek Golf Academy offers individual and group lessons for women-only, beginner, intermediate and advanced golfers. Call 866.901.3151 to schedule your next lesson.